Why Having a Small Birthday Party for your Toddler is the Best! I'm a self diagnosed Pinterest addict, like many of you are, and I often stumble upon children's birthday party ideas that Martha Stewart herself would repin. It seems that planning a child's birthday party is almost as stressful as planning a wedding these days, and I'm saying no- at least until he's old enough to request his own birthday party ideas. For Mason's first birthday, I ended up inviting way too many people for the size of our townhouse. Mason was overwhelmed, the guests were crowded, and I was exhausted. My cousin and I had spent a lot of time perfecting the cakes instead of ordering them (they did look awesome though), and mama was tired. For his second birthday we decided to have a small family party at my Nan's house. We invited grandparents, a couple of very close friends and immediate family- and it was awesome! Mason actually ended up not feeling well that day, so I was very thankful his party was small and not overwhelming for him. I also think it was so special that we had the party at my Nan's house. Mason was surrounded by the people who adore him most, and any time spent with his great grandparents and grandparents is SO special. Also, if you think it's mean to not invite his friends, just know that he sees his friends at preschool almost every single day, plus at any local events we go to. He spends lots of time with them considering he's only (almost) 3 years old. 1- They get to spend time with family they might not always get to see. If you have a small party with mostly family, your child will be creating wonderful memories with people they may not get to see often. I cherish the precious moments when Mason is sharing a story with my grandfather, or pulling at my Nan's apron to get her attention. These wonderful people won't be around forever and it's so important to allow your child to get to know their family. Moments like this wouldn't be as possible (or as special) with 20 other children running around creating chaos everywhere. Our family lives about an hour away, so events like this are so special in bringing us together. You all know I love saving money, and having a smaller party allows us to spend our money elsewhere. Instead of spending $50 on treat bags, you can put it towards another gift, or a special day out. I'm all about quality over quantity, and I would much rather put my money towards something meaningful instead of junk that's just going to be thrown out in a day or two. Anyone who's ever thrown a child's birthday party (or any big event) knows how annoying it is to wait for RSVPs. Some people RSVP yes and don't show up, some RSVP no and change their mind last minute, and some don't RSVP at all (those monsters!). If you have a small party you can almost eliminate that stress completely. Have you ever thrown a huge party? Think of all the waste there is after! All of that garbage, uneaten food, half eaten food left by picky toddlers, left over cake that will never get eaten, etc. Also, think of the unnecessary gifts you won't have to worry about finding room for. If your toddler is anything like mine, they already have WAY more toys than they need. Like I mentioned above, a small party will give your child quality time to spend with loved ones they don't get to see often. There's no way a 3 year old would spend time with family when they have 15 friends running around. A small party gives the opportunity for great conversation, lots of laughs, warm hugs and lots of love. Also, small parties don't have to be boring! We still do a theme, balloons and cake. Next weekend Mason is having a dinosaur themed party at my Nan's house, with the same kind of guests as last year. 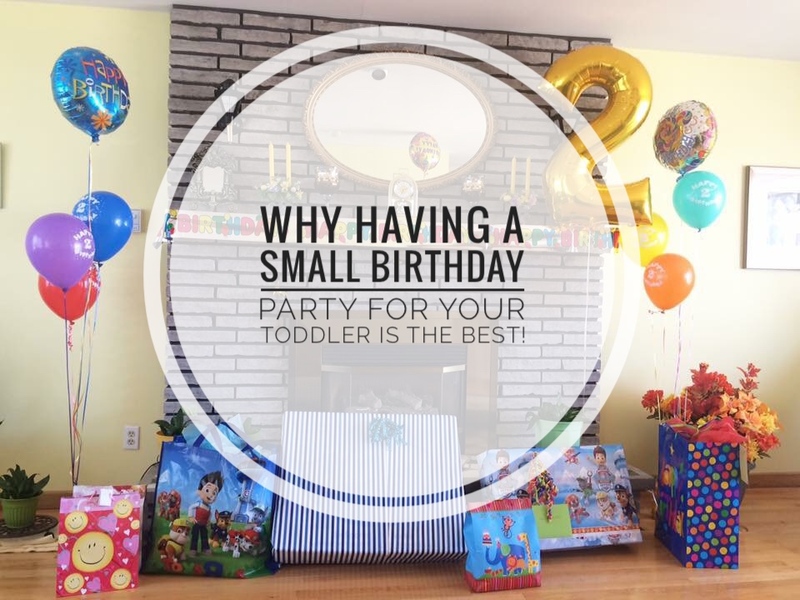 When he's older and requests something different for his birthday, we'll be more than happy to oblige, but for now we're cherishing these sweet small parties. Comment below and tell me how you do birthdays at your house! I totally agree! I wish so badly we had enough friends (especially ones who are not flaky!) to do the whole Pinterest party thing because that is totally my jam, but it's just not the case. :( Maybe one day! I've already planned to do this with my son's first few birthday parties. My sister-in-law did this with her kids and we all loved the intimacy of the celebration. Great post! When they're little to understand or care for huge parties, this is a great idea! I know I'm not a fan of huge parties.. I'm not a fan of birthday parties with friends either.. but I do it for my oldest child. The younger ones at 2 and 1, they could careless. I get them their favourite character on their cake, balloons, everything in decor, but I don't hold huge parties. We also do cake on the day of their birthday, with candle blowing. But we don't invite extended family until much later. This year, I celebrated all three of their birthdays with family. We totally agree! 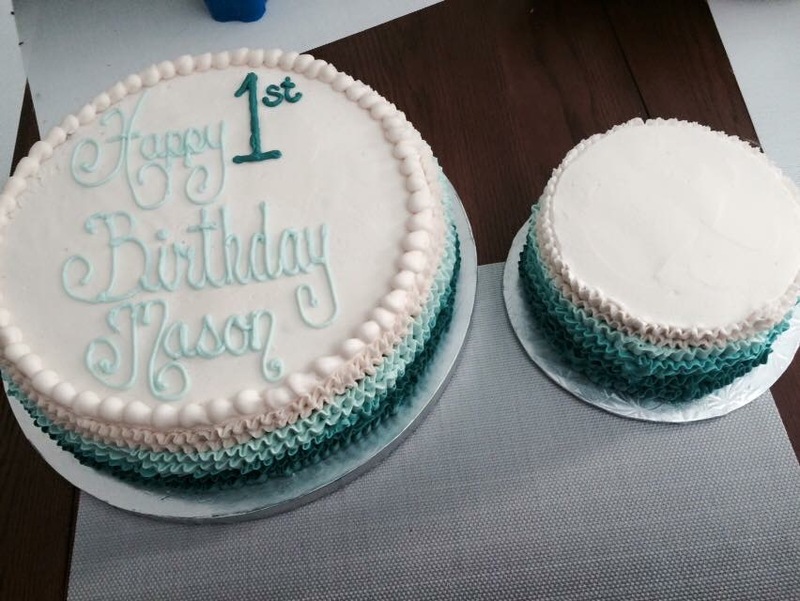 We had fairly big first birthday parties for our kids- but the second year will be much smaller. We'd rather spend that money on experiences and time with them! I totally agree. Right now we have small family birthdays. I think when my children get to the age that they can invite their friends then we will expand a little bit more. We had a small birthday party for my son when he turned one and it was exactly what we needed! You definitely save a lot of money! I'm excited to throw my daughter's first birthday party! Small parties are so much more relaxed and enjoyable than huge one! Making memories that bring joy! My son will be turning one fairly quickly and we keep talking about we want to celebrate. I think for the early years we are going to keep it to family get togethers with only the closest friends. I would love to do a big all out party, but it's just not practical for him at this point - especially since he probably won't remember it anyways. My sons 2nd birthday will definitely be small. His first birthday over half the guests didnt show and had one excuse or another. Which kinda funny they are asking about his 2nd party already as it will probably be at a zoo or aquarium. We live in a tiny apartment right now so family-only is the absolute limit -- Raptor's first birthday had 25 guests (immediate family, her godlessparents, and three other very close friends) plus the three of us. The place was absolutely wedged. This year her birthday falls on Easter so we're having a 'do for his side "down here" on the Saturday, then going up to my family (about 1.5 hour's drive north of where we live) and having a second family party at my parent's house on the day itself.